The days are getting shorter, and the often stressful holiday season is rapidly approaching. 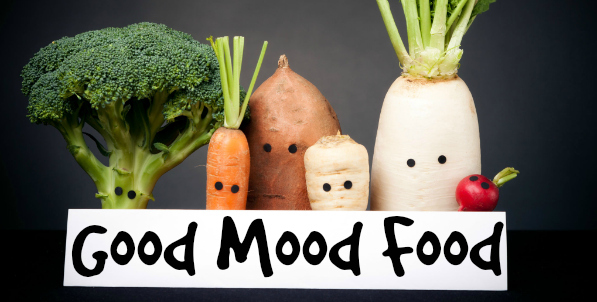 If you’re feeling a bit down in the dumps, out-of-sorts, or just plain grumpy, try making some dietary tweaks to help improve your mood. It’s a pretty well-known fact that what we consume at our first meal can greatly affect our mood for the entire day. Refined carbs will spike your blood sugar, setting you up for a crash later in the day that can make you irritable and cranky. Waiting too long to eat after getting up might result in some poor food choices, as well as a slow to fully wake brain and body. What to put on your plate? Studies are showing that regardless of mood disorder, a 50% improvement in mood is seen when omega-3 fats are increased in the diet. The American Psychiatric Association is even making the suggestion. Our brains are 60% fat, and the more flexible the fats are, the lower the risk for mood disorders. Polyunsaturated Omega-3s fit that bill. They’re great for heart health, too, but increasing their consumption may also ward off depression. The two most important for our purposes are EPA (eicosapentaenoic acid) and DHA (docosahexaenoic acid), and all it takes is 2 servings of fatty fish (salmon, anchovy, mackerel, herring) per week to get the benefits. Unfortunately for vegans, plant-based Omega-3 ALA, (alpha-linolenic acid) has not shown to produce these benefits. While walnuts and flaxseeds are nutritious and a great addition to most diets, they have not been shown to have any mood-boosting properties. In 2010, researchers at the Chicago Health and Aging Project noticed a link between high levels of vitamins B6 and B12 in the diet and a lower chance for depression. Speculation is that deficiencies in these B vitamins, as well as B9, or folate, can lead to elevated homocysteine levels, which, in turn, have been associated with depression. Blood tests are the only way to tell if you’re actually deficient in B vitamins, but eating select foods to increase your B vitamin consumption is a healthy choice. Follow a mediterranean diet: Fortified whole-grain cereals. Green peas, lentils, peanuts and other legumes. Nuts such as almonds and pecans. Most fruits and veggies, so eat lots of produce, including lots of dark leafy greens. Milk and milk products such as yogurt and cheese. Chicken, fish, eggs. Sugar and refined foods deliver a triple blow to mood. They’ll set you up for a blood sugar crash (and the resulting crankiness). They’re devoid of the nutrients needed to keep the brain healthy. And finally, they’ll impact your brain chemicals that influence mood, like dopamine. At first, eating these types of foods might elevate your mood, but pretty soon it takes more and more to feel that high, and even a steady amount to simply keep your mood stable. Yuck! A great way to take charge of the cravings is to make more mindful decisions surrounding your food choices. I’ve written several articles about mindful eating, but my favorite is asking yourself these 3 simple questions every time you eat. I always prefer to eat whole foods instead of taking supplements whenever possible. Unless your doctor has suggested you increase your intake of anything on this list via a pill, please stay away from the supplement aisle and try the Farmer’s Market instead. Here’s to maintaining a happy and healthy mood this trying time of year!